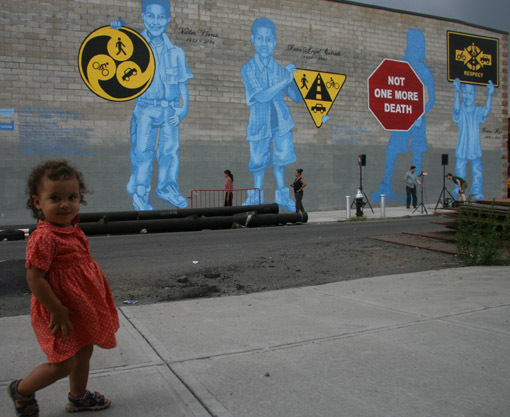 Could community-designed murals, like this one in Brooklyn, New York, be used to inform the public about important transportation issues in Washington, D.C.? Photo via Streetsblog. Monika Kerdeman is the communications and finance coordinator for The Access Initiative (TAI), a global network that promotes access to information, participation, and justice in environmental decision-making. TAI is a project of the World Resources Institute, where EMBARQ, the producer of this blog, is also headquartered. In this post, Monika describes ways in which the District Department of Transportation can work with the community to improve information-sharing about traffic patterns, public transit routes, and biking and walking initiatives. After attending last week’s event on “Online Engagement for Sustainable Urban Mobility” in Washington, D.C., I came up with some low-budget ideas to make information about transportation and urban planning more accessible to the public, with a special focus on communities where people don’t have access to the Internet, speak a variety of languages or don’t pro-actively engage in finding out information about transport changes, even though these changes could greatly benefit their livelihoods. I submitted my recommendations to Lance Schine, DDOT’s new chief information officer, who was one of the panelists at last week’s event. While it’s important to engage with people through online tools – including social media, interactive websites, mobile apps and other digital devices – it’s equally important to remember how to engage with people face-to-face, on the ground, without relying on technology-enabled solutions, to bridge the digital divide. In the developed world, we often times tend to over rely on technology to inform people. However, Joseph Foti and Lalanath de Silva note in their latest publication, A Seat at the Table: Including the Poor in Decisions for Development and Environment, that communication channels and language barriers can often hinder access to information. Additionally, while many issues might be dealt with using technology, some solutions might require deeper understanding of the local culture and therefore require less technological approaches. Of all these impacts, the one that may be the most confusing will be the new pattern at the New York Avenue and Florida Avenue intersection. Anyone who travels this intersection knows the myriad of left turns, or better yet restricted left turns, traffic signals, crosswalks, and significant competing traffic. The ongoing construction is part of a safety improvement project that will change the direction of traffic creating a “virtual circle” around the center of the intersection where the Wendy’s is. Klein acknowledges that people who “receive [DDOT’s] press releases, monitor our tweets, are a Facebook friend, or see our posted Variable Message Signs” have probably already heard about the new traffic patterns on what is affectionately being dubbed “Dave Thomas Circle.” But what if you’re not plugged in to any of these channels? How are you supposed to know about the important changes to your commute? An easy way to address these problems would be to install signage in the appropriate locations and engage the community to work with the DDOT to develop usable information for that community. For this project, I would propose that DDOT engage people in the community, including children, to create signs that are colorful and stand out so people read them. They could include more pictures if people can’t read. DDOT can pay them a marginal amount and this would give kids something to do in the summer, as well as get community members involved in the process of understanding what changes are taking place. This is also an opportunity for DDOT to make signs for the new signed bike-pedestrian trail so that people can find the access points to get on it. This trail seems to connect the Eckington and Bloomingdale communities to the New York Avenue Metro station and Union Station, and it is much safer route. At the present time, there are no signs for this path and few people use it. Think this is a good idea? Vote to have this fixed on SeeClickFix – https://seeclickfix.com/issues/43270 – where I’ve submitted a report with photos. Mural Art – Post information in communities where smartphones do not exist; let sidewalks, walls and other streetscapes be the analog equivalent of digital touchscreens. Community Transportation Centers – Create public spaces near public transit or information kiosks about DDOT’s services and changes; encourage people to have public meet-ups and share information about what is happening in D.C. on transport issues; use existing resources like Adams Morgan’s community board. Information Education – Work with schools to distribute information on public transport, bicycling and walking; integrate this into their health or physical activity curriculum. Business Partnerships – Partner with local businesses to post information about DDOT and public transit.